What is allspice? About the ingredient allspice. Including 955 recipes with allspice, nutrition data, and where to find it. Allspice is a small scrubby tree, very similar to the Bay Laurel in size and form. It can be grown outdoors in the tropics and subtropics with normal garden soil and watering. Smaller plants can be destroyed by frost, although larger plants are more tolerant. It adapts well to container culture and can be kept as a houseplant or in a greenhouse. The plant is dioecious, meaning plants are either male or female and hence male and female plants must be kept in proximity in order to allow fruits to develop. Pure, Ground Allspice - A single spice that adds warmth and depth to desserts, pastries and sauces Incredible Value - Full 1 pound bag! Packaged fresh right here in the USA Allspice is the unripened berry of a small evergreen. Use it in desserts and preserves as well as gravies and marinades, with fruits as well as meats. 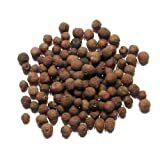 Allspice is usually found in the spices section or aisle of the grocery store or supermarket. Allspice is a member of the Spices and Herbs USDA nutritional food group. 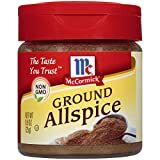 How much does allspice weigh? There are 965 recipes that contain this ingredient.